Both Pep Guardiola and Jose Mourinho are unquestionably two of the best managers in the world of football at the moment. 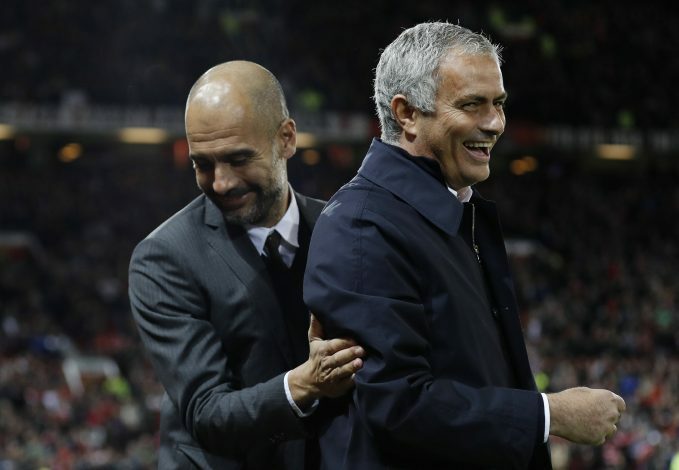 The two shared an intense rivalry during their days with Barcelona and Real Madrid, and are currently at the helms of two arch-rivals as well, managing Manchester City and Manchester United in the Premier League. Whilst Guardiola has enjoyed a lot of success with his high-flying Cityzens, having won the league title last season, Mourinho seems to be struggling at Old Trafford at present, despite having won three trophies in his debut campaign with the Red Devils. Given their current situations, the general consensus is that Pep has quite surpassed Jose, and is now officially the better manager. However, one legendary footballing figure seems to strongly disagree. According to the legendary Diego Maradona, the Portuguese tactician remains a superior gaffer as compared to his Spanish counterpart, despite his ongoing issues at the Theatre of Dreams. Maradona claims that the only reason Guardiola has been performing better is due to the enormous financial backing he has been receiving from his club’s Qatari owners, as that cash enables him to buy literally any player that fits his footballing philosophy. Speaking to Spanish publication Marca, Maradona stated: “For me, yes, Mou is the best. I would give Pep the merit of taking advantage of the launch that Johan Cruyff gave him. Do you agree with the Argentinian legend’s assessment?